My son's first academic essay met with mixed success, he tells me as we're headed to Glasgow University Library to find the books he needs to help him write his second. "I passed," he says. "But the tutor didn't like my 'regrettable attempts at humour'. That's worrying. I didn't know there were any. Must have sneaked in when I wasn't looking." "Humour does that," I say. "I used to get 'You are childish and unfunny' from my English teacher at school. And my former wife, come to think of it. Usually followed by 'Put your clothes on.'" "My wife. Now I get told my writing is 'useless drivel'. I once got a rejection letter from some snot-nosed punk straight out of journalism school, who told me he aimed to discourage 'tired jokes and hoary old clichés'. "The column of a colleague, which I always enjoyed, was dismissed by one reader as 'worthless and uninteresting small talk'." "Pompous people are scared of humour," he tells me, stepping unhindered through the turnstile and continuing talking as he fades in the distance, while the metal bar catches me in the fleshy parts, setting off a siren and causing armed guards to erupt from the door behind the desk. "On the ground!" the first one barks out the side of his mouth, flexing a bicep like the dome of St Paul's. "Show your ID!" "Oh bugger," I think to myself. I was supposed to get a new staff card ages ago, so the electronics in mine must still be using valves instead of transistors. Also the photo of my face has faded so it's just a dim, grey, shapeless blob. "Good likeness," the guard says, studying the card. "You may enter." "What was that about?" my son says, when I catch up with him in the short loan section. "Dodgy admin again," I say. "I need a secretary." "Me too," he says. "What books are you looking for?" "Got an article to write on the science of pain," I tell him. "Actually not just the science. They've had me talking to scientists, engineers and philosophers around the Uni, all researching aspects of pain." "I like philosophers," he says. "The Art School is big on Michel Foucault. One of his critics called him 'an intellectually dishonest, empirically unreliable, crypto-normativist seducer of Postmodernism.' So I guess you and I got off lightly." "I studied philosophy for a while," I tell him. "We had this lecturer who'd go 'What do we mean by pain?' Then he'd stop and scratch his big, bushy beard. Then he'd go 'What do we mean by mean.'" "See that's the trouble with philosophy," my son says. "You can easily disappear up your own Aristotle." "Regrettable attempt. What's the brief for your essay?" "'Discuss with examples how maps reflect power over space, materials and people," he says, glancing at his notes and grimacing. "What is that about?" "I wonder if we could combine our research and find maps of pain," I say. "Like those sensory homunculi you get in science centres," he says. 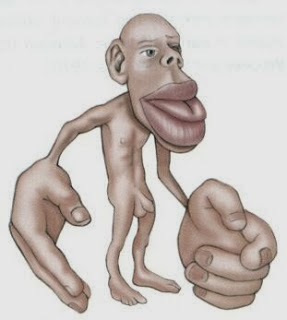 "You ever notice their hands and lips are huge, but other parts that seem sensitive aren't shown that way. Is that censorship or is it true?" "These are deep waters, Watson," I tell him. "You'd need to ask Rachel. She's set up science centres around the world. So how are you going to keep humour out of this essay, when you come to write it, especially if you don't know you're doing it?" "I've been reading this article on how to stop yourself laughing at inappropriate times," he says. "It's packed with great suggestions. So when I start writing I plan to bite my lip and sit with my feet in a basin of icy water. That'll keep me serious." "I doubt it," I say. "What do you get from sitting on the ice too long, taking photographs?" "Polaroids," he says. "What's an ig?" "A snow-house without a loo," I tell him, shaking my head. "Regrettable. Deeply regrettable."